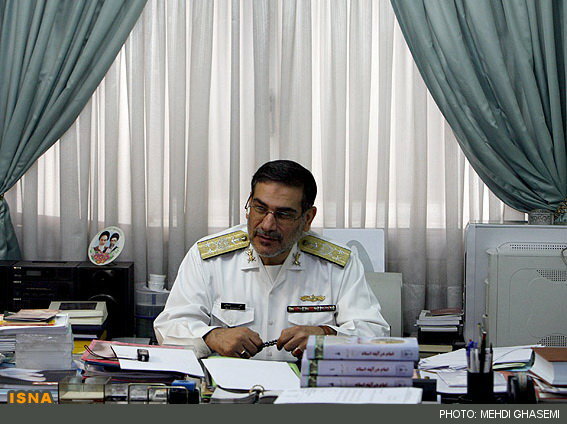 Iranian President Hassan Rouhani today appointed Rear Admiral Ali Shamkhani as the Secretary of Iran’s Supreme National Security Council (SNSC). Admiral Shamkhani is considered as the general officer closest to the moderates and reformists in the country. He served as defense minister in the eight years of Khatami’s presidency. During the Iran-Iraq war, Shamkhani served as the deputy commander of IRGC and the minister of the Revolutionary Guards in Mousavi’s cabinet. During Rafsanjani's presidency, he was transferred to Artesh and was appointed as the commander of the navy and later assumed the joint command of Artesh and IRGC navies at Khatam-ol Anbia headquarters. After Khatami’s surprising victory in 1997, he became the defense minister. He retains his rank as a two-star rear admiral. Admiral Shamkhani replaces Saeed Jalali in his new post. It was not clear if the admiral was also appointed by the supreme leader as one of his two representatives at SNSC. Traditionally, the secretary of SNSC is one of the two representatives. It was not also clear if Jalili, an archconservative, will retain his seat at the council. Before the presidential election, Rouhani and Jalili were the two representatives of the supreme leader in the council. Breaking with tradition, Rouhani also appointed his foreign minister, Mohammad Javad Zarif, as the country’s new chief nuclear negotiator. Until now, the secretary of SNSC was the chief negotiator. Zarif’s appointment to the post became official on Thursday. Dehghan served as deputy to the then defense minister, Ali Shamkhani, during the presidency of Mohammad Khatami from 1997 to 2003. From 2009 to 2010 Dehghan was the deputy to Ali Shamkhani in the Armed Forces Strategic Studies Center. Now Dehghan is defense minister and Shamkhani is appointed as Secretary of Supreme National Security Council.